The "Pigeon's Comprehensive Dictionary of New Testament English and Greek Words "covers the vast majority of common wordsand all the proper names of people andplaces found in the New Testament. It waswritten to serve as a primary referencetool for students of the New Testament, those who teach the Word of God and allthose who read it. This Dictionary takesinto consideration the terms used by sevenexcellent translations of the Bible: J. N.Darby, King James, New King James, NewInternational (1984, 2011), New AmericanStandard and English Standard versions.In this Dictionary, for the vast majority of cases, all the Biblical references for the entries of the terms listed are provided, thus allowing the work to also serve as a concordance. It contains definitions for approximately 97% of all New Testament Greek terms. The second part of the Dictionary is a glossary of all Greek terms, relating them to the entries of the corresponding English terms. Overall the Dictionary contains close to 8,000 English terms which are defined or are presented as cross-references, and more than 5,500 Greek terms.For each English term listed, the reader will find the corresponding Greek term or terms. As a general rule, each entry or subentry includes the transliteration of the Greek word, the class of word, the Greek word, the Strong's code as well as the etymology of the word (and the meaning of the name of the person or place), and a definition of the term; paraphrased verses and other N.T. references are provided, enabling the reader to understand the context in which the term is used. AMG’s Comprehensive Dictionary of New Testament Words covers all the common words and the names of people and places found in the New Testament. It was written to serve as a primary multi-functional reference tool for students of the New Testament, those who teach the Word of God and all those who read it, with or without Greek knowledge. 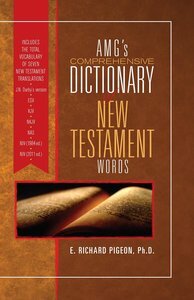 AMG’s Comprehensive Dictionary of New Testament Words takes into consideration the terms used by seven translations, among others, of the Bible: English Standard Version, J. N. Darby version, King James Version, New American Standard Bible, New International Version (1984, 2011) and New King James Version. In AMG’s Comprehensive Dictionary of New Testament Words, for the vast majority of cases, all the Biblical references for the entries of the terms listed are provided, thus allowing the work to also serve as a concordance. Part I contains definitions or cross-references for more than 8,000 English terms as well as definitions for approximately 5,600 Greek terms. Part II is a lexicon of all the Greek terms of the New Testament, relating them to the entries of the corresponding English terms in Part I. For each English term listed in AMG's Comprehensive Dictionary of New Testament Words, the reader will find the corresponding Greek term or terms. As a general rule, each entry or subentry includes the transliteration of the Greek word, the class of word, the Greek word, the Strong’s number, the etymology of the word and the meaning of the term if it is a person or place. It includes as well a definition of the term, paraphrased verses enabling the reader to understand the context in which the term is used, other New Testament references and, when occasions arise, different Greek words found in other manuscripts. You will find AMG's Comprehensive Dictionary of New Testament Words to be a complete and multi-functional, yet a simple and useful tool to better understand the Word of God. About "Amg's Comprehensive Dictionary of New Testament Words"